I am salivating a bit at getting some pictures of the “rare and unique Revere Ware” pieces. If you visit, please send me some. Living about 10 miles outside of Rome, I find quite a lot of vintage Revere (and Oneida) products here. Still quite affordable though the prices in shops have gone up with the success of eBay. Your site is a treasure of information and I rely on it to identify certain pieces or, more often, to determine what actually goes with what! 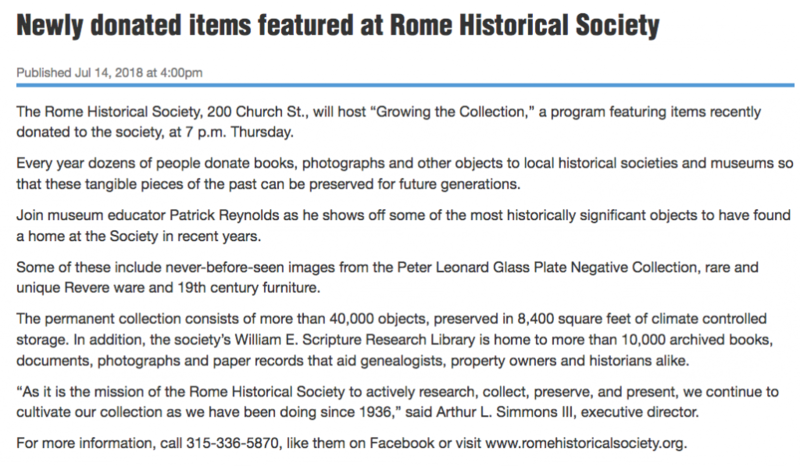 So thanks for doing this and yes, I’d be happy to stop by the Rome Historical Society and send you pics of what they have on display! Id love to see whats on display in the museum also, if you get pictures, please post them in your blog! Thanks in advance! !